Twenty-two years ago, a brash 20-year-old rookie goalie from Quebec named Patrick Roy led the famed Montreal Canadiens to the Stanley Cup championship, and, in the process, won himself the Conn Smythe Trophy. It can happen for the Habs again this season, only now the rookie goalie is a quiet 20-year-old from British Columbia named Carey Price. Price, though, isn't the only fresh face already making an impact on his team in the playoffs. There's a handful, and NHL.com is here to tell you all about them. Here are five from the Eastern Conference, starting with the guy you already knew about. Carey Price, Montreal Canadiens: By now, you all know the story of how Price landed the No. 1 job in Montreal. You also have heard that by trading veteran Cristobal Huet at the deadline, Canadiens GM Bob Gainey was basically hitting on a 16 and praying for a five. He may just get it. Through four games against Boston in the Eastern Conference Quarterfinal round series Price has a 1.20 goals-against average and a .957 save percentage. He has stopped 110 of 115 shots. Montreal leads the series, three games to one. Since taking over as the No. 1, Price has gained confidence normally reserved for a goalie well beyond Price's years and experience. He actually seems relaxed despite the fact that he is basically the elephant in the room these days. He finished the regular season 24-12-3, with three shutouts, a 2.56 GAA and a remarkable .920 save percentage. Actually, this shouldn't be so surprising at all. Just last season, Price embraced the pressure of the AHL playoffs and took the Hamilton Bulldogs all the way to a Calder Cup championship. Earlier in the year, he went 6-0 with two shutouts and a 1.14 GAA at the World Junior Championships in leading Team Canada to another gold medal. Sergei Kostitsyn, Montreal Canadiens: Habs fans should remember Dec. 12, 2007. That's the day Gainey went fishing in Hamilton for the younger Kostitsyn – the kid brother to Montreal first-liner Andrei Kostitsyn -- and reeled him up to the big club in Montreal. Ever since, Kostitsyn has provided the Canadiens with a bundle of secondary scoring, making an impact by playing more than 14 consistent minutes a game, including some time on the League's No. 1 power play and being a strong presence on the forecheck. After registering nine goals, 18 assists and a plus-9 rating in 52 regular-season games, Kostitsyn has two goals and a plus-2 rating through four playoff games. He scored a goal in each of Montreal's first two victories. At the time of his call-up, Kostitsyn was leading Hamilton with 22 points in as many games. The Habs' seventh-round selection in 2005 was a dominant force last season playing on the same line with Patrick Kane and Sam Gagner for the OHL's London Knights. He had 40 goals and 91 assists for 131 points in just 59 regular-season games. He netted another 21 points in 16 playoff games. Kris Letang, Pittsburgh Penguins: Although he was a force as an offensive defenseman in the QMJHL, it's not Letang's prowess with the puck that the Penguins crave. They have enough playmakers and goal scorers to fill up the stat sheet, so what they want and get out of Letang on a game-by-game basis is consistency and durability. Ever since making his season debut on Nov. 15 after getting called up from Wilkes-Barre/Scranton of the AHL, Letang has played more than 18 minutes per game. He has provided offense from the blue line (six goals, 11 assists in regular season), and has played some key power-play shifts, as well as seeing some time with the Penguins shorthanded. Letang did not register a point in his first three playoff games, but was contributing a solid 21 shifts per game, including several on the power play. Brandon Dubinsky, New York Rangers: On July 1, the debate among Ranger fans was who would be Jaromir Jagr's center, Scott Gomez or Chris Drury? The merits of each free-agent signee were debated with some believing Gomez would be the guy because his passing and ability to see the ice and skate it well would open room for Jagr. Others figured it would be Drury because his hard, drive-the-net style would open even more room for Jagr to work the right wing. Rangers' rookie, Brandon Dubinsky, has been an important factor in their playoff run. He has registered two goals and an assist in three games played. Rangers coach Tom Renney tried both. He settled on Dubinsky. 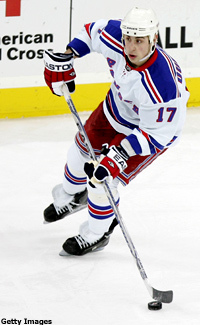 Dubinsky's been one of the Rangers best players this postseason through three games against the New Jersey Devils. He scored two goals and had four shots on goal in Game 3. He also registered an assist in Game 2. He has four penalty minutes and seven shots on goal while playing an average of 17:39 a game. If you go by the thinking that Jagr is supposed to be the Rangers best player and he's the one that has to have a big postseason for the Rangers to make a big run, than it's not totally far-fetched to say that, among New York's centers, Dubinsky is the most important. Nicklas Backstrom, Washington Capitals: It's not out of line to say the Washington Capitals are in the playoffs because of Alex Ovechkin. It's also not out of line to say without Nicklas Backstrom, Ovechkin may not have had as marvelous of a regular season as he did. Backstrom led all NHL rookies with 55 assists in the regular season. He was second among rookies with 69 points. He also had a plus-13 rating. He has one assist through three playoff games, and has continued to play roughly 21 minutes a game. Even before Michael Nylander was lost for the season to a torn rotator cuff in January, Caps coach Bruce Boudreau turned to Backstrom -- the young Swede who is less than two years removed from being the fourth overall selection in the NHL Entry Draft -- to center Ovechkin's line. The two young Europeans developed instant chemistry, on and off the ice, and now Backstrom is a leading candidate for the Calder Trophy as NHL Rookie of the Year.